With as many movies as I’ve watched in a theater, in my home, or on my computer, it seems to get harder and harder to try and recreate that movie magic feeling. What is movie magic you may ask? Well, for every movie buff it’s a little different. For me, it’s that feeling of being swept away, encompassed with the emotion and passion of the film. After the thousands of films I’ve watched in my life, there is only a hand full that have been successful in recreating that magic. Hugo can be added to that very short list. The story follows the title character Hugo Cabret (Asa Butterfield); an intelligent young man who manages the intricate and massive clocks in a Parisian train station and educates himself in the creation of artistic mechanisms. Hugo watches the world revolve around him from the windows and lookouts in the clocks he works on and lives in. He is trying to fix an automaton, an automated robot-like man, which his father was trying to fix before he unexpectedly died. Hugo is trying to unveil the secret of the automaton in an attempt to connect with and finish a passion of his fathers’, and also find some aspect of peace in his father’s sudden demise. However, a magician who owns a toy shop at the train station and, much like Hugo, has an understanding of the internal mechanisms of the automaton makes Hugo’s journey take an unexpected turn. The toyshop owner is none other than iconic French film pioneer George Méliès (Ben Kingsley), who in his latter years has grown disenchanted with the changing times and loss of his passion in life, film. Both Méliès and Hugo are searching for something in life, it is their unexpected relationship that helps assist with their journeys. Scorsese’s passion for film is displayed in every frame of this film and is as much a letter of love to the genesis of filmmaking as it is a story of his own life. The film plays in two parts, showcasing the adventures of the young boy surviving in the train station and the life and career of the great Méliès. The combination of fantasy and reality is played upon and executed masterfully in both the reality of Hugo who see’s the world as a great fantasy and the life of Méliès who succumbs to reality but embraces peace in the fantasy of film. The treatment of CGI and the element of 3-D, which I am always hesitant and concerned with, are utilized to enhance and invite the viewer into the experience instead of bombarding and overwhelming the story and the viewer with a gimmick. The use of archived footage from original films of the silent era adds an authentic feel, just as the recreation of some of Méliès films add a touch of fantasy through the use of CGI and 3-D applications. This aspect of the film is an extremely difficult part to execute, but it does so seamlessly. Ben Kingsley embodies Méliès with subtle confidence, and Asa Butterfield portrays Hugo with wide-eyed fascination and a mature mentality. The supporting cast is fantastic as well, particularly Sasha Baron Cohen as the train stationmaster and Chloë Moretz who plays Isabelle, a sort of muse for Hugo’s journey. 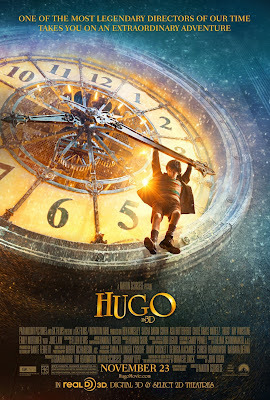 Hugo is passionate film from a scholar of film; embraced with more love than any piece of cinema I’ve seen this year. This film may not relate well with some children, but for film fans of the birth of silent and early era cinema, this film is a must-see. Hugo left me with the feeling I search for every time I walk into the theater, the magic of being completely enveloped and, I think most important, satisfied from start to finish. Monte’s Rating…4.75 out of 5.00.